The International Council of Fine Arts Deans (ICFAD) is a vehicle through which members share information and ideas that enhance the leadership of Deans and Associate Deans, Provosts and Associate Provosts, University Presidents and other Arts Executives in Higher Education. 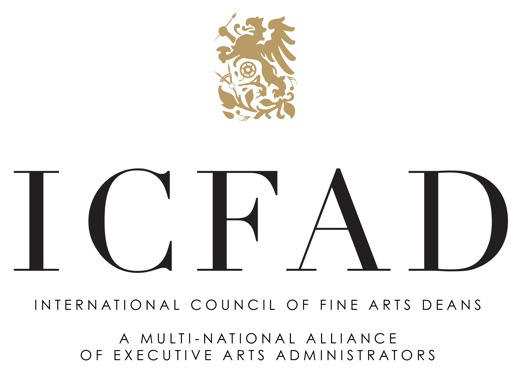 Founded in 1964, the ICFAD membership is comprised of deans and arts executives in higher education throughout North America and around the world. ICFAD is the only organization focusing exclusively on issues that impact Deans and Associate Deans of all creative areas in higher education including fine and performing arts, arts education, art history, architecture and communication. ICFAD strives to provide a foundation that allows arts administrators to do their jobs better and to expand their circle of contacts with people who share common challenges and experiences. ICFAD helps train new Deans and hone the talents of those who will be rising into leadership. Annual conferences provide direct help, training, and advice on issues that are faced by all: advocacy, fundraising, personnel review, and leadership vision, just to name a few. ICFAD also shares exciting new ideas and innovations developed by our colleagues. ICFAD puts you in contact with other Deans who share your interests, background, and challenges. For example, the ICFAD Forum lets you immediately contact the entire membership for advice or information. ICFAD's international efforts are also expanding and its upcoming events will focus increasingly on innovative international programs and exchanges. These will be of value as you either establish or refine your institution’s international programs. A summer international symposium, which focuses on specific international arts issues, is held every three years. ICFAD provides professional development opportunities and facilitates forums for the exchange of ideas, information and issues of common concern for the arts in higher education. ICFAD will commit to significantly increase its value to all members and strategically advance the importance of the arts in higher education. ICFAD is a non-profit organization. ICFAD shall not lobby to influence legislation other than as an insubstantial part of its activities and shall not engage in propaganda.